Contact us for instructions on returning items. Phone 705-252-5700. Claims for incorrect items or damaged goods must be processed within 2 days of received date (received date according to delivery records). Return items must include a copy of your invoice and return authorization number received in advance from us prior to the items shipped back to us. Shipments returned to us will be prepaid by the customer. When items are shipped in error by us we will issue a full credit to the customer (including return shipment cost). Shortages in shipments must be reported to us within 2 days of receiving items. Returned merchandise must be complete, clean, unused and in its original packaging. A restocking fee of 20% will apply to any used or open products or packages. Items that came with any bonus items, free items etc. that are not returned will be charged the full retail value of the missing item and will be deducted from credit issued. Please note that by ordering from our website or over the telephone, you are indicating that you have read and understood these guidelines. All About Sewing Machines reserves the right to amend this policy at any time without prior notice. If you purchased an item and the price is reduced or goes on sale within 10 days of your purchase we will issue you a GIFT CARD for the difference. Exceptions apply i.e. Black Friday, BOXING DAY and Final Clearance. Your item must be in its original unused condition in order to be returned, unless there is a manufacturer defect in which case it will be up to the manufacturer to replace the item for you. You must return the item within 10 days of purchase un-opened and in original condition. 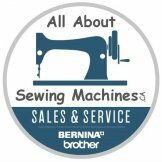 SEWING MACHINES, IRONS, STEAMERS, DRESSFORMS, THREAD, INDUSTRIAL MACHINES, SCISSORS, CUT ITEMS, PARTS, and GIFT CARDS are not eligible for refund. Exchange only if your item is in like new condition. You may exchange your item for another item of equal or higher value (you pay the difference) or receive store credit.